Students from the University of Plymouth have designed and led an intervention to help children and families overcome fear of the dentist. Working with the Family Intensive Intervention Project, the Dental Therapy and Hygiene students from Peninsula Dental School designed the session to include trying on dental clothing and protective equipment, and identify problems with ‘teeth’ on a mannequin. The Family Intensive Intervention Project is run by Children Young People and Families Services at Plymouth City Council, and works with families experiencing multiple difficulties, such as poor health, housing issues, antisocial behaviour and substance misuse. Taking place at Devonport Dental Education Facility, the session also included tooth-brushing tips, handwashing advice, and the opportunity to find out how much hidden sugar is in a variety of food and drink. 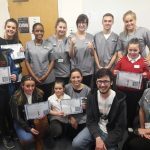 The session took place as part of the students’ Inter-Professional Engagement module – which the University runs on its BDS Dental Surgery and BSc Dental Therapy and Hygiene programmes in partnership with Peninsula Dental Social Enterprise (PDSE) and community engagement charity, Well Connected. Wayne Kirby, Practice Manager for the Family Intensive Intervention Project, explained why the session was so useful: “For me, it’s about planting that seed, especially for the young kids. Some of them are quite anxious about the dentist, especially if their parents are anxious too.